Watch related video by Zlatica Hoke. World powers have wrapped up a meeting with representatives of Libya’s two rival factions with an affirmation of support for a U.N.-backed plan that would establish a unity government. 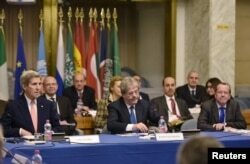 The representatives of 17 countries and four world bodies held talks with Libyan officials in Rome on Sunday, in a meeting chaired by Secretary of State John Kerry and his Italian counterpart, Paolo Gentiloni. It took place as Libya’s two rival governments prepare to sign the unity agreement in Morocco on Wednesday. It is time to “break the deadlock” and move forward for the future of Libya, said Kerry, in a news conference with Gentiloni and U.N. envoy Martin Kobler. Kerry said a communiqué signed by world powers in Rome called for all parties to accept an immediate and comprehensive cease-fire, once the agreement is signed. Kobler said in addition to the rival governments, the deal would also be signed by Libyan political party leaders and other officials. It is important to have “critical mass” because this agreement needs legitimacy, he said. The majority of Libyans are "sick and tired" of conflict, the inability to provide governance and the growing presence of Daesh (Islamic State), said a senior State Department official. U.S. Secretary of State John Kerry (L), Italy's Foreign Minister Paolo Gentiloni (front C) and United Nation's envoy Martin Kobler (front R) take part in an international conference at the Ministry of Foreign Affairs in Rome, Dec. 13, 2015. In a background briefing Saturday, the official said these factors helped spur the country's rival factions to move past their differences and consent to signing the U.N.-backed agreement on December 16. The official said the Rome meeting is to "demonstrate the full alignment" of Libya's neighbors, regional players and other members of the international community, to show support for a national accord in Libya. Gentiloni said the new Libyan agreement had to be "inclusive" in order to be maintained. "We cannot have a third Libyan government in exile in addition to the two parallel ones in the country," he said. The move to lend support to Libya to help it repair its frayed government comes at a time when there is growing international concern about Islamic State's presence in the country. A November report by a U.N. monitoring group said the terrorist organization had 2,000 to 3,000 fighters in Libya, about half of them in the coastal city of Sirte, which has been under Islamic State control. "The ISIL central command in Iraq and the Syrian Arab Republic views Libya as the best "opportunity to expand its so-called caliphate," the report said. Libya's Islamic State woes have also been troublesome for its neighbors. The Islamic State group has claimed responsibility for several attacks in Tunisia, including a June attack in the resort city of Sousse that left 38 people dead. Tunisian authorities said the gunman trained at a militant camp in Libya. FILE - Tunisian lifeguards and medics transport a covered body in the resort town of Sousse, a popular tourist destination 140 kilometers (90 miles) south of the Tunisian capital, June 26, 2015. "It is clear that Libya needs to have one government that is capable of getting trained and equipped in order to be able to take on Daesh more effectively," said the senior U.S. State Department official. The official added that world powers expected Libya to seek additional international help, once the U.N.-backed agreement is in place. Libya's instability heightened following the 2011 ouster, and later killing, of former leader Moammar Gadhafi. For more than a year, an internationally recognized government has operated out of the country's east, while Tripoli has been controlled by a militia alliance with Islamist support. If both sides follow through with their commitment to sign the U.N.-backed agreement on December 16, work would then begin on establishing a Cabinet and other key positions that would be part of a unity government based in Tripoli. In previous rounds of talks, the two sides agreed that U.N.-nominated Fayez Serraj would lead the new government. FILE - Awad Mohammed Abdul-Sadiq (L), the first deputy head of the Tripoli-based General National Congress (GNC), and Ibrahim Fethi Amish from the internationally recognised House of Representatives sign documents after reaching an agreement. The plan calls for the unity body to be formed within 40 days and include members of both of the current governments. Kerry traveled to Rome from Paris, where he took part in an international summit on climate change.